Higantes festival to kick off on Nov. 23 to showcase typical Filipino Marionettes. Higantes Festival, a colorful and fun celebration in honor of San Clemente in Angono Rizal, the Philippines, will kick off on Nov. 23 as usual, Ms. Maricon Basco-Ebron, tourism director and attach? at the Embassy of the Philippines said on Nov. 7. "The Festival now showcases that the people of Angono can excel in their own chosen fields, to be proud as a Filipino and as a community." Ms Ebron said. 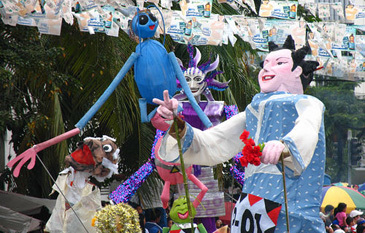 Higantes are made of paper mache, with varnish or sometimes polyresin. For the body of the Higante they often use bamboo and rattan, but now, some use aluminum because it's lighter and easier to bend. Artists are very creative and they have a wide variety of materials to use to improve their artwork. It weighs around 10 kilos and is carried by one person underneath the Higante. One can make a Higante in around 2-3 weeks time. The Higantes Festival are participated by some of the native artists of Angono such as Bukalan, Nene Miranda and the Tahan family to name a few. "Angono is known as the Art capital of the Philippines. Why? Because everybody in Angono can paint. Famous artists came from this noble town like Botong Francisco (visual art), Lucious San Pedro (Music), The Blanco Family (where all the family members are artists from the grandchild to the grand parents), Nene Miranda, and Orvil Tiamson to name a few," she explained. Food is a must try in Angono, from their famous Fried Itik (Duck) to a sumptuous meal in an exotic restaurant where you can try adobong bayawak (large lizard) or adobong ahas (snake). Angono also has a cave called Petro Glipse. It was discovered by Mr. Botong Francisco where he was able to find stone age inscriptions inside the cave. This is now protected under the National Historic heritage and is open for public viewing. More than a century ago, Angono was a Spanish hacienda where the townspeople were prohibited to hold pagan celebrations and where only one festivity was allowed - the town fiesta in honor of its patron saint San Clemente. Because of this prohibition, Angono folk naturally made the most of this one festival. They prepared lots of food, wore colorful costumes, held a big procession featuring big papier-mache caricatures of their Spanish landlords. These multi-colored, humongous, comical and sometimes scary 12-footers were called Higantes. Today, the Higantes Festival is now only a part of a two-week long celebration of the Angono Town Fiesta. The activities revolved around the church and its townspeople, beginning with the Misa Cantada, a special sung mass; a novena and a procession. Daily activities such as the Higanteng tiangge (flea market) are held at the Municipal Park Plaza. There are singing and dance contests, fried Itik (Angono's prized delicacy) festival and cooking competition, a 5k fun run, on-the-spot painting contest, an art exhibit, a job fair, a bingo and videoke challenge, government employees' parade, and of course, the highlights of the festivities, the Race of the Higantes and the Procession of the Pagoda. The Prusisyon of the Pagoda is the culmination of the festival where practically everyone is out on the street, either as a participant or a spectator. After the early 6 a.m. mass, representatives of Angono's 13 barangays converged on the church grounds, fixing their costumes and performing a last run on their choreography, parade steps or musical repertoire. Finally, at the tail end of the line are the Higantes? tall, big and proud. Suddenly, the streets feel so much smaller as these gargantuan figures dominate the scene. We may have already seen them in action the day before, but still, we couldn't help but stare in awe and gawk in submission at their presence. "Ah, they are our allies and protectors," we positively assured ourselves. Over the years, the method for creating the Higantes has seen some changes. On the eve of the Higantes Parade, we wandered around Angono trying to find a famous restaurant that they say serves the best fried itik. Instead, we found Higantes lined up by the sidewalk still undergoing prep work for the big day. Our curiosity took us inside the shop where they are made and saw parts of the "behemoths" waiting to be assembled. The lady in charge was kind enough to give us a run down on how they are made. The old technique, she said, of doing the head is by papier mache. A mold of the head is carved out of clay and once the clay mold is dry, strips of paper are glued, one on top of the other until the right thickness is achieved. The papier mache is then dried and cut open to separate it from the mold. The hollow head is glued back together again and painted with the details of the face. The body is just a skeleton frame made of yantok or bamboo strips. This is done to really make it very light for one person to carry. Once the shape is formed, it is dressed up in yards and yards of fabric resembling their characters. The finished head is then attached to the body and a person can go inside and carry the Higante around. In the new method, which this shop employs, the same technique is applied but different materials are used. For the face mold, plaster of Paris is used instead of clay. Fiberglass is applied to the mold instead of paper and thin strips of aluminum are used for the body frame. These materials are better as they are more durable and withstand the elements quite well. We found out that different shops make Higantes in different ways. As thousands joined the procession, thousands more lined up the streets to watch and? ready for this ?splash water on unsuspecting participants and onlookers. They had water bottles, squirt guns, and even drinking glasses, spraying water on everyone passing by. I'd say: A little ‘San Juan' adds fun! The revelry and camaraderie of the people are unbelievable. After winding through Angono's roads, the street procession ended by Laguna Lake where the image of San Clemente, patron of the Fishermen, was loaded on a boat for the fluvial procession down the river and back to the church.